The bread names offer a bit of fanciful fun: Rough & Ready (with its sunflower seeds, millet, flax, oats, and sesame), Little Rosie (with rosemary), Carried Away (with caraway), and Q&A (for its inclusion of quinoa and amaranth). 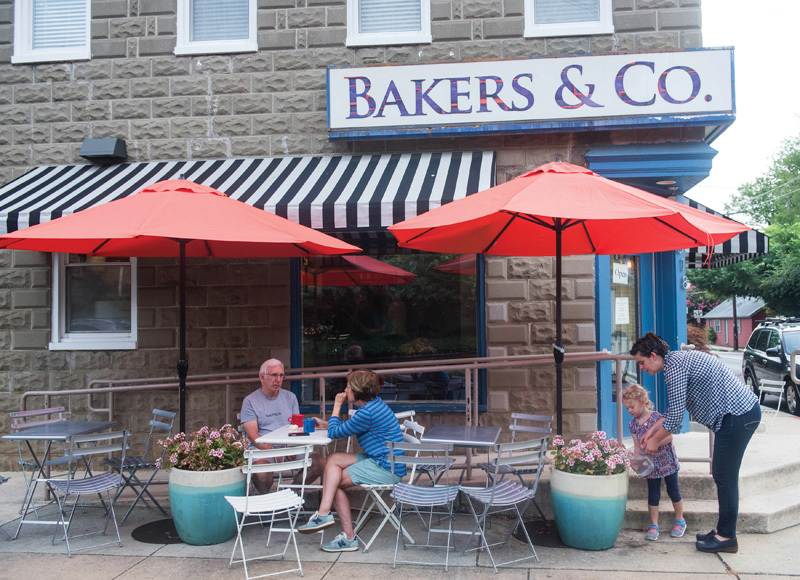 Taste them and you’d think that Bakers & Co. owners Lucy Montgomery and Chris Simmons have been baking for a lifetime. 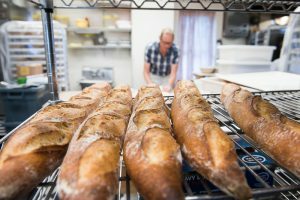 Chris Simmons, owner and baker, prepares bread dough as fresh baguettes cool on the bakery racks early in the morning at Bakers and Co. in Eastport. For the husband-and-wife team, the path to a stand at the Saturday Anne Arundel County farmers market in 2007, and then the opening of their café in Eastport in 2012, has resembled a levain, a bread starter. Since they began baking, they’ve used the same levain—something they’ve lovingly tended and has grown, deepened, and become more complex with age. Today, they offer not only naturally leavened breads, but also muffins, scones, croissants, pasties, quiche, and even soups made from family recipes. Montgomery met Simmons at St. John’s. They were often competitors in the kitchen, seeing who could make what, and better. This applied to breads, viennoiserie (pastries), and Christmas pudding. They took up bread baking on a whim one winter, after they’d read lots of books about it and knew what they liked. After a while, Simmons took a few classes at King Arthur Flour Baking School in Vermont, where he studied with master baker Jeffrey Hamelman. This was helpful, not only to gain knowledge of bread behavior and techniques, but also to help create a buffer against the inevitably recalcitrant processes involved in baking: “To paraphrase [Hamelman]: ‘The best thing about being a baker, whether you have a great bake or not-so-great bake, you get to do it all over again tomorrow,’” says Montgomery. A busy Friday morning at Bakers and Co. in Eastport. Customers come in for fresh baked breads, pastries, soups and coffee and tea drinks. In recent years, bread has gotten a bad rap in some circles. But the questions are: What kind of bread? What kinds of ingredients? How is it made? “True bread is flour, water, salt,” says Montgomery. “Natural, wild yeast is what is attracted to these ingredients.” And all together, they make magic. Even though many bakeries use commercial yeast and starters in combination, says Simmons, Bakers & Co. uses only natural starters for its breads and no preservatives or conditioners. “We are at the mercy of a fickle, living thing that dictates your schedule—a bit of a diva amidst the full orchestra of viennoiserie, muffins, cookies, galettes, etc.,” says Simmons. When using a natural starter, everything has to be just right. “It’s all about time, temperature, general activity. You need it to behave at a specific point and specific time. Levain has a life of its own, and things are always changing. Despite your best efforts, you are always having to make adjustments. You are constantly gauging time, temperature, humidity,” he explains. The payoff is worth it, looking at the bench full of shaped boules in the baskets ready for their final proof. 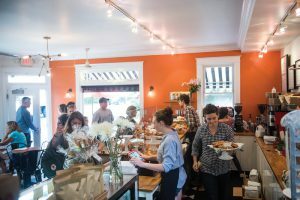 The proof is also found in the community of people that has sprung up around Bakers & Co.—whether at the Saturday farmers market or at the café, which is open Wednesdays through Sundays—people are always running into others they know and conversing. Montgomery, who handles the farmers market, takes deep inspiration from the customers, from Jim monitoring his garden for the first tomato of the season to blush, and Juanita and Pat, who share their hopes for glimpsing a brown thrasher on their bird-watching adventures, to Simon and Ruth, who recommend different recordings of Schubert’s Winterreisse, and Mrs. Barbera, whose smile is joy incarnate. 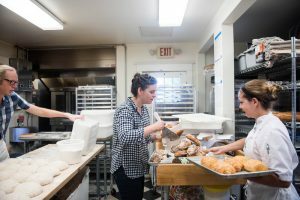 Owners Lucy Montgomery and Chris Simmons work with baker Stephanie Squires during their busy morning baking routine at Bakers and Co. in Eastport. Error: Error validating access token: Session has expired on Saturday, 09-Mar-19 15:57:50 PST. The current time is Tuesday, 23-Apr-19 01:40:16 PDT.